Earth Hour is a worldwide event led by the World Wide Fund for Nature and held March 23rd, encouraging households and businesses to turn off their non-essential lights for at least one hour raising awareness about the need to take action on climate change. Off course we join Earth Hour 2013, though our climate change agenda is every day, not just today. 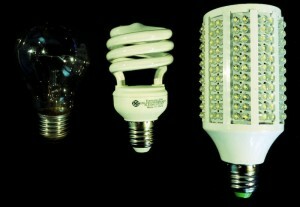 In the four generations of lighting technologies (traditional lightbulb, halogen ,compact fluorescent and LED) we only use version 1, 3 and 4. Roughly keeping the same lumens, we achieve a decrease of power – 100 watts for lightbulb , 20 watts for fluorescent, 8 watts for LED. The LED technology we use delivers warm light spectrum, something that was just available to general public in the last 6 months. Our strategy is simple, phaseout compact fluorescent into LED and reuse the traditional lightbulb on areas that we need light less than 15 hours per year (e.g. attic). We don’t foresee buying more lightbulbs.